Welcome to Creators Going Pro, where in partnership with Semaphore — a creator-focused family of companies providing business and financial services to social media professionals — we profile professional YouTube stars who have hit it big by doing what they love. Each week, we’ll chat with a creator about the business side of their channel, including identifying their Semaphore Moment — the moment they truly went pro. 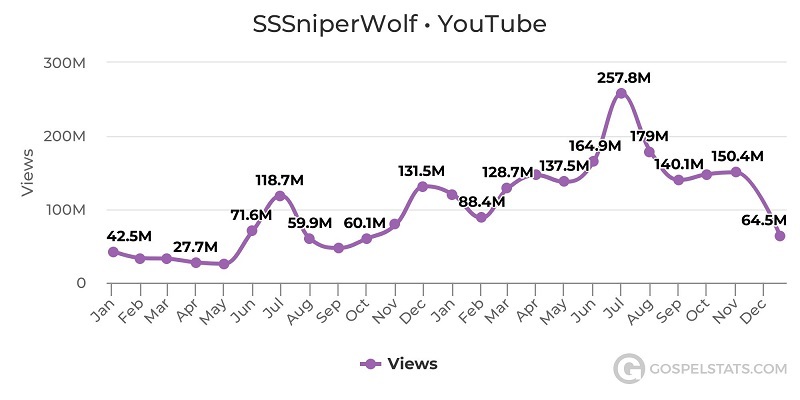 Her real name may be Lia Shelesh, but 20 million fans across the internet know her by another name: SSSniperwolf. A longtime gamer and cosplayer (a type of performance art where creators dress and often role-play as fictional characters, usually in costumes they made themselves), Shelesh has had her YouTube channel since 2013. Over the last five years, she’s built up an audience of 13.2 million subscribers, and now nets between 150 and 200 million views per month, putting her at just over 3 billion views total. On Instagram, where she often shares progress shots of her handmade cosplay gear, she counts 3.8 million followers. She also has more than one million Twitter followers and 60,000 Twitch followers. Nowadays, Shelesh still games, but she’s switched up her YouTube strategy, moving around March 2017 from being an entirely-gaming channel to mostly reaction content, with gaming splashed in here and there. Going by viewership numbers, her strategy pivot has paid off, and she’s also netting new subscribers at an impressive rate: nearly one million in June 2018 alone, and at least 450,000 every month since. Check out our chat below with Shelesh about what led her to YouTube, the day-to-day of running a massively-followed channel, what it was like to transform her content, and what the future holds. Tubefilter: You’ve been playing video games since you were very young — tell us a little about how you got into gaming. We’re also keen to hear about how you got into cosplay. Alia Shelesh: As a kid, my brother and I would always get into fights. To stop us from fighting, my dad bought us a PlayStation One. And, it worked. Instead of fighting, we played video games. We would start playing as soon as we got home from school, all day, and every weekend. Because I was a year older, I would always be player one, and he would be player two. Ever since then, I was hooked. Since my parents were super strict, we were not allowed to go over to our friends’ houses, parties, school dances, or even on field trips. So, I spent my time at home gaming. The first time I cosplayed was when I was 10 years old for Halloween. I wanted to be Bulma from Dragon Ball Z, so my mom and I made the costume. I wore black pants, a black shirt, and a yellow vest with a blue wig. No one recognized my costume. The following year, my mom sewed me a satin pink kimono and I dressed up as Botan from Yu Yu Hakusho, another favorite anime. When I was 13, I begged my mom to take me to an anime convention, but she refused. Then finally, when I was 18, I managed to to get tickets to Comic-Con in San Diego. My whole family drove down to San Diego, and I was able to attend my first convention. It’s not as easy to cosplay now that I have a YouTube channel where I upload daily and stream weekly, but I still love it and try to find time to do it once in awhile. Tubefilter: What made you choose YouTube as the place to share your content? What was the catalyst for you deciding to start a channel? AS: There were mainly only two platforms: YouTube and Dailymotion. So I chose YouTube. I used to watch a lot of Call of Duty montage videos and gameplay, which was the real inspiration for launching my own channel and sharing my gameplay. Tubefilter: You’ve changed up your content a lot over the years. How did you decide to move from primarily posting video game content to posting lifestyle and reaction content? What kinds of content have you noticed get the best audience reactions? AS: Yes, I’ve changed it up a lot. I have always experimented with different content in order to see what my audience likes, and also to determine what I enjoy creating. You never really know what you want to do unless you try everything. I started with gaming videos, then began incorporating challenges and vlogs. Now, I mostly post reaction videos. Uploading gaming videos everyday became very stressful, because I wanted the content to be both good and entertaining. I would record for several hours just to get enough clips, sometimes even feeling like the clips weren’t good enough. It was becoming too much to handle, so I began streaming instead. There were times where I just wanted to chill and play games with my friends without having to worry about making a video. In my spare time, I would watch a lot of YouTube videos about crazy things or read funny articles. I wanted to share all that with my audience too, because when I truly enjoy something I want to share it with the people I love. Now, I have many people who enjoy my reaction content, which blew my channel up to new heights I never thought would be possible — so it makes me think, Is this it? Is this what I was meant to do? Haha, I don’t know, but I enjoy it, so I’m just going with the flow. Tubefilter: When did you get your first check for online video revenue? How much was it for? AS: Haha, I can’t believe I actually remember, but it was February of 2013, and I made $19. Not bad, right? Tubefilter: What about your first check outside of AdSense $? Have you had any sponsorships? AS: Over the years, I’ve had sponsorships from headsets like Turtle Beach, gaming chairs, energy drinks, and major brands like Samsung. I’ve even had my own characters created in games. Tubefilter: How many people are on your team? What’s it like behind the scenes? AS: For the longest time, it was just me doing all of the recording, editing, and uploading daily. A one-woman army. One of the best decisions I made last year was hiring an editor. He was actually a fan who watched all my videos and loves editing. So, I lucked out. I don’t have any employees, but I do have a manager — Kevin Gould at Kombo Ventures. When it comes to recording, it’s still just my camera, a box (that I use as a tripod), and me behind my computer. I like to keep things simple. Tubefilter: What was that Semaphore Moment for you—the first time you realized you were a professional YouTuber? Tubefilter: What’s your production schedule like? Do you have a set filming schedule/upload schedule? AS: The only schedule I ever follow is that I can only record at night, usually after midnight. I procrastinate A LOT, and I stay up very late, till 6 a.m. most nights. I never really plan anything; it’s more like it will happen when it can. I used to record, edit, and upload one video a day, every single day, for over a year, which wasn’t really working out and made me BEAT. So, I started recording two to three videos a day, three to four times a week, so I could have some days to plan things out. Tubefilter: Have you ever struggled with creator burnout? What do you to combat it? AS: I have been uploading daily for several years now, and every few months or so I get very burned out, sometimes not knowing what to do. My friend is also a YouTuber, and she uploads daily so sometimes we get ideas from each other. Also, my subscribers will tweet me ideas for videos, which is very helpful. Tubefilter: Has anyone supported you in your journey to being a full-time creator? Are there any fellow YouTubers who have inspired you? AS: My mom, who is still my biggest supporter. I was in college when I started making YouTube videos, and I convinced my mom to let me take a year off and try it out. She let me, and it all worked out. At least no more homework. YouTubers who upload daily inspire me because it takes A LOT to come up with new content every single day, and I admire their grind. If I had to say I look up to a YouTuber, it’d probably be my friend, Mariale. She has three channels and uploads every day, and I really admire how hard she works. Tubefilter: What do you think is the most vital skill you possess as a creator? AS: I don’t know if I have one strong skill, but rather multiple skills I’m okay at. Something I used to be awful at but have gotten better at is improvising. I know a lot of YouTubers plan out videos, write down ideas, etcetera, but I just go into it with nothing, and whatever you get is just all real. Tubefilter: What’s next for you and your channels? What are you building toward? AS: I never know what’s next, because this world continues to surprise me. Right now, I’m just trying to enjoy life, eat good food, and spend time with my friends and family. I”m hoping to expand my channel and content, and along with it, you will just have to wait and see!